Facebook Event | Lunch Provided | Accessibility Van On-site. 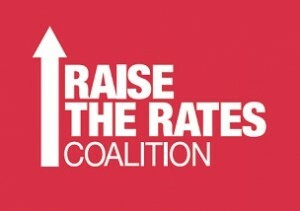 On October 17, the International Day for the Elimination of Poverty, the Raise the Rates Coalition is calling everyone out on the streets for a march to demand an immediate raise to social assistance rates and an end to the punitive system of surveillance and degradation that shrouds the provision of income support. After 14 years of Liberal rule, poor people in Ontario are worse off now than they were in the mid-nineties. Nearly a million unemployed and under-employed people are forced to eke out an existence on sub-poverty social assistance rates that forces on us the impossible choice between food, shelter, and caring for our families. The record is telling. After refusing to reverse the Mike Harris cuts of the mid-1990s, the Liberals announced a “Poverty Reduction Strategy,” in 2008 which, after 5 years, failed miserably at meeting its targets. In 2014, they followed it up with another 5 year strategy to meet the same targets, but this time with no timelines attached. Meanwhile they initiated a ceaseless merry-go-round of social assistance reform commissions, reports, studies, consultations and, this year, a 3-year Basic Income Pilot, with even more studies, and consultations to follow. It’s clear that the only strategy being employed is one of deferring action, while dangling the promise of poverty reduction. In addition to allowing inflation to eat into the meagre income of people on social assistance, the Liberals have cut millions of dollars in benefits. The elimination of the Community Start-up and Maintenance Benefit in 2013 alone resulted in a claw-back of at-least $275 million ($55m * 4) over the last 4 years. Left in the wake of that crucial benefit, used by thousands to meet emergency housing and health-related needs, is a mess of municipal funds – such as the Housing Stabilization Fund in Toronto – that have drastically reduced access to emergency funds and fueled homelessness. History demonstrates that gains can only be won by poor people with political agitation and a threat to undo the status quo. Waiting for the Liberals to “reduce,” let alone end, poverty is more futile than rearranging the deck chair on the Titanic. We are willing to wait no longer and on October 17, we will build a fight that will win an immediate raise to social assistance. Join us! This entry was posted in Uncategorized on October 16, 2017 by admin.